Spc. 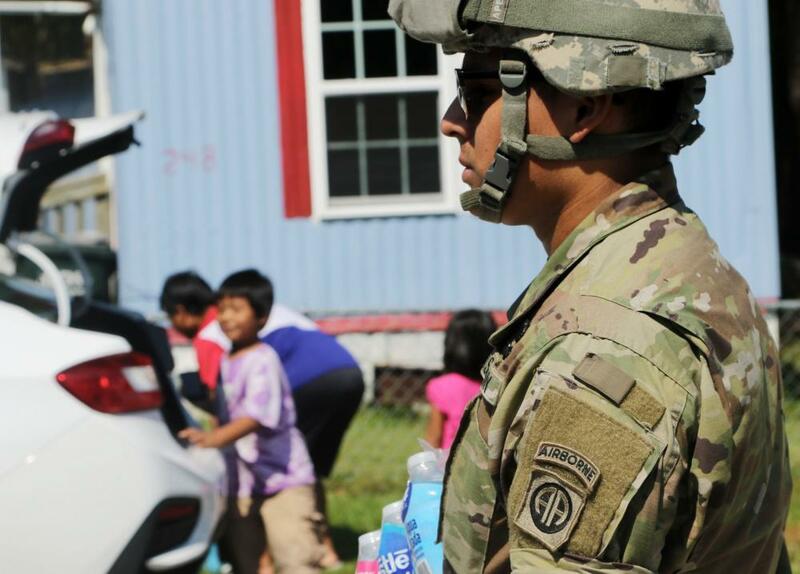 Ruben Ismael Alvarez, a parachute rigger assigned to 151st Quartermaster Company, 189th Combat Sustainment Support Battalion, Sustainment Brigade, 82nd Airborne Division carries a package of bottled water to a family in New Bern, North Carolina, Sept. 21, 2018. He and his crew spent 27 hours clearing neighborhoods in Hoke County. “This one lady, she came out to us crying because her house was pretty much ruined due to all the flooding,” he recalled. She begged for help moving her vehicles, hoping to salvage something from the water. Alvarez and his fellow paratroopers rescued 199 civilians and 132 pets during the storm. He said he felt humbled to be able to help so many. When Hurricane Florence hit Southeastern North Carolina last month, Fort Bragg and the city of Fayetteville were drenched with rain and rising floodwaters. Hundreds of soldiers aided in rescue and recovery efforts, even as some saw their own homes flooded or evacuated. Sergeant 1st Class Jason Ragucci was at his home with his family in North Fayetteville when Florence hit. “I’ve been through an earthquake, I’ve been through tornadoes, but nothing like Hurricane Florence,” he said. The storm drove a branch through his roof and flooded the ventilation system. As he worked to mitigate the damage, other family members and neighbors asked to shelter at his house. Eventually, they were all forced to move to Pine Forest High School as the Little and Cape Fear Rivers rose. “It was already full, but we made it work,” he recalled. Ragucci said his 17 years in the Army have taught him to be resilient.